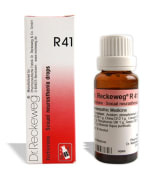 Reckeweg-R41 Sexual Weakness Drop is a homeopathic medicine for early discharge. The formation of rings can be noticed in the albuminous molecules bringing about a rarification of water and consequent parching. After-effects of debilitating illnesses, overwork on physical or other planes, overexcitement, nervous exhaustion. Against various kind of ailments in old-age. As these albuminous molecules loose their working efficacy they can no longer fulfil their detoxicant role towards the cells. This in turn means an accumulation of harmful tissues. The composition of R41 has been adapted in such a way as to influence the different systems, with special emphasis on the vitality glands. It is universally admitted that the function of the germinal glands affects the whole life-current in an individual. A licensed pharmacy from your nearest location will deliver Dr. Reckeweg R41 Sexual Neurasthenia Drop. Once the pharmacy accepts your order, the details of the pharmacy will be shared with you. Acceptance of your order is based on the validity of your prescription and the availability of this medicine.